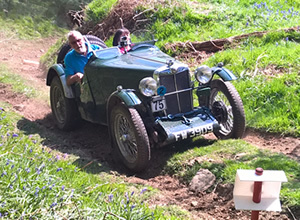 This years event was again held at Warcop Army Ranges, situated just north of the A66 midway between Scotch Corner and Penrith. Paul and Dave joined me at the Davey homestead for the customary fish n chips before heading off. Mike was on holiday in the Greek Islands enjoying some sunshine whilst Mark was meeting us at Warcop, he needed to get away soon after the event as he had another rally on Monday is Essex with Dave Longfellow – a shakedown for their trip to Jersey in October. Heading up the scenic route to Brough via Keighley, Skipton, M6 and A685. Scrutineering was at the small service area in Brough and our accommodation being a bit on the large side, we decided to head up to the service area first, and parked up the camper before heading off to Brough. Noise check and scrutineering completed with the able assistance of Heidi and Chris Woodcock was followed by signing-on. Documentation completed we returned to join the team at the camper. Mark forgot to mention we had a driver briefing at 5:30 so we jumped back in the car and returned to scrutineering just in time to here a few words from the organisers, but it’s now compulsory for single venue events . It must be nearly beer-o-clock, so off to the camper for the start of a very social evening. Some of the usual folk were missing but it didn’t stop us have a very pleasant sirloin steak washed down with a bottle or two of red. Some of the hard-core then set about destroying a bottle of brandy whilst Mark and I were more restrained and were more focussed on the rally. A few interesting cars were starting to appear in the service area; an ex-works Proton Satria with huge brakes, an Austin Maestro – yes! A Maestro – but no ordinary British Leyland rot box – a very nicely turned out car fitted with a Honda VTEC engine – not everyone’s cup of tea, but watch it go!! Morning dawned all too soon, one or two of the team seemed a little hung-over – I wonder why?? 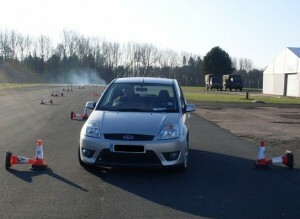 Steve Johnson (RDO for MSA) set-up stall next to us with his trusty Micra, he was joined by two more Micra’s . More cars and service crews arriving and the service park beginning to fill-up. The sky was clear and it looked like moulded slicks was the tyre choice. Malcolm set to with swapping tyres whilst I got the bacon and eggs frying. A start time of 9:10 allowed for a leisurely breakfast before donning overalls and helmet, firing up the Scooby we headed off for MTC1. Forming an orderly queue behind 58 and 57 – our due time appeared and still 2 cars in front of us – Mark was confident it was “time”– so I jumped the queue, only to find the start time had been deferred 2 minutes. Somewhat embarrassed we parked up and waited what seemed an eternity. After the disappointing outing a few weeks ago on the Tyneside I was determined to try my hardest. The first stage was a good start, stopping the clock at 9:16 – faster than last year. The second stage didn’t go as well – we dropped about 15 seconds with being balked by a White/Yellow Corsa and still stopping the clock at the same time as stage 1. 2 down – 6 to go. Stages 3 and 4 were the longest of the day. A minor indiscretion on stage 4 at a square left raised our heart rates little – I was somewhat surprised as to why the back of the car was trying to get in front – this was resolved when we got to the finish line – it does hep when the centre diff is engaged. Stages 5 went with issue and were slowly climbing up the leader board. As we looped round for Stage 6 I noticed the petrol gauge was registering a bit low – no time for an unscheduled service, so fingers crossed that we had enough to get to the end of the stage. Pulling in to the final service I thought we must have been running on vapours – surprised to see the gauge was now registering a quarter. 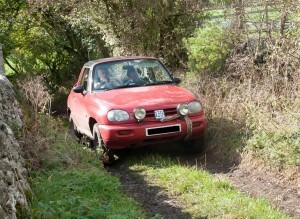 Throwing in another can of Shell V Power and swapping tyres, front to rear we headed out for the final pair of stages. Stage 7 was a clean run – we let the Hobsons pass as they were on the final run and needed to make up tie from the bad stage 1 time. Stage 8 was a bit more interesting, as we came round to the merge I spotted a couple of cars in front of us – passing the first was accomplished just after a hairpin left and the second soon after – I was on a mission and no intention of repeating last years mistake of putting it off on the last corner. 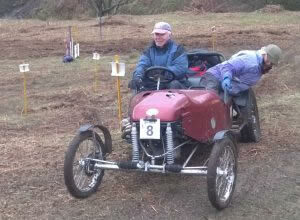 The finish line crossed – 32 O/A and 13 in Class – a great days sport. Many thanks to Malcom, Paul and Dave for servicing the car and keeping us well fed. The organisers and MoD for allowing us access to such a quality venue. Will we back next year?